As a leading institution at the forefront of banking and finance education in Indonesia, Perbanas Institute is committed to partnering with prominent local and international institutions as a measure to enhance the know-how and skillset of its highly-proficient faculty members. Furthermore, Perbanas Institute’s research-driven focus guides the continuous development of its innovative curricula which emphasises the importance of both soft and hard skills. By prioritising in joint research initiatives to improve upon its teaching resources, Perbanas Institute is well-poised to adapt to the future trends of the banking and finance industry. Through its growing network of higher education partners in Indonesia and overseas, Perbanas Institute is able to offer student exchange programmes as part of the institute’s learning process. Moreover, Perbanas Institute continues to make available additional English language-based study programmes in order to accommodate to the rising number of international students in addition to producing globally-minded graduates. Amongst its comprehensive list of partners is the International Islamic University Malaysia that is a well-known institution with a longstanding background in the development of shariah banking and finance education. On 17th March 2016, Perbanas Institute in cooperation with the CPA Australia hosted its latest public lecture session on the topic of “The Impact of AEC on Risk Management for Indonesian Banking Industry”. The event took place at Perbanas’ Unit V building and featured guest speaker Mr James Loh as a Councillor of CPA Australia – Indonesia and Partner from KPMG Indonesia as well as Ms Retty Setiawan as Country Manager of CPA Australia – Indonesia Representative Office. Hosted by Perbanas Graduate School, the class aimed to succinctly highlight areas of opportunity in addition to challenges related to the local banking and finance industry amidst greater competition – as elaborated by the Rector of Perbanas Institute Prof. Dr. Ir. H. Marsudi Wahyu Kisworo during the opening speech. 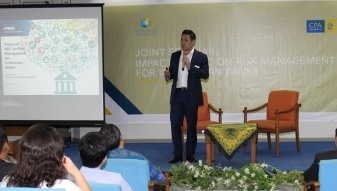 Prominent attendees of the class also included lecturers invited by CPA Australia, Perbanas Institute’s esteemed partners, enrolled postgraduate students, and a number of the institution’s faculty members. As such, participants were provided comprehensive teaching materials by Mr Loh namely on Risk Management Regulations and Management Perspectives, Risk Management-Regulatory and Management Perspective, and the Foundation of Risk Management for a Bank such as credit risk. Perbanas Institute’s longstanding partnership with CPA Australia therefore illustrates its commitment to produce highly-adept students equipped with a high level of intelligence and skills. Perbanas along with CPA Australia is set to host programmes and events on a more frequent basis covering topics related to developments that have a direct impact on the banking and finance sector.